Most of you know I love everything in animal print. 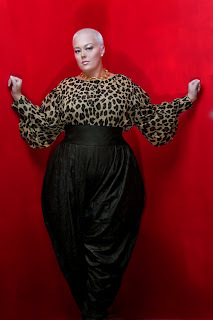 So, I have been following Chasity who is the blogger for GARNER STYLE: The Curvy Girl Guide and I have some nice pictures of her from her blog page http://garnerstyle.blogspot.com.au/ ... Looks like we share the same love for animal print. So, this time around she is showcasing how to dress up or down the simple leopard pencil skirt. She posted pictures of her dating back in 2009 and some of the recent pictures where she is wearing different leopard pencil skirts. I am definately gonna get myself a similar skirt too. I really like how classy and playful the skirt can be. I am really inspired. Amber Rose in a slouchy pant/jumpsuit.